Green Team is pleased to distribute Green Eats dishes by Green Toys. It’s dinnertime with the world’s most environmentally friendly dish set! Includes everything you need to serve a meal for four, and do something great for the planet. 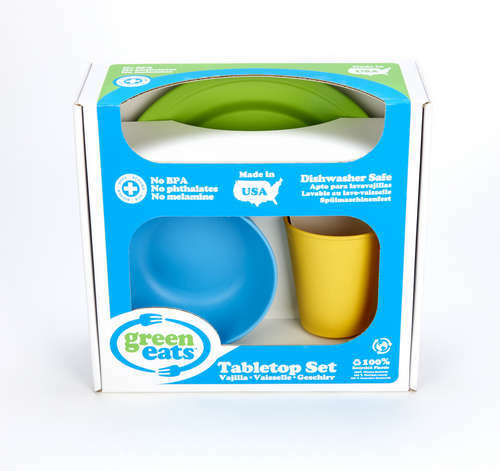 The Green Toys™ Dish Set is made in the U.S.A. from 100% recycled plastic milk containers that save energy and reduce greenhouse gas emissions. This set gives new meaning to the term “clean plate”. Safe, non-toxic, BPA-free, and even meets FDA food contact standards. Dishwasher safe. To order Green Eats and other eco-friendly products, apply for a Green Team wholesale account. This entry was posted in Blog and tagged green eats, green toys. Bookmark the permalink.